Adulteration Test Strips or Specimen Validity Test (S.V.T.) are a rapid, one step screening test. Simultaneous detects the presense of Creatinine, Nitrite, Glutaraldehyde, pH, Specific Gravity, and Oxidants/Pyridinium Chlorochromate (PCC) in human urine. After one (1) minute the colors of the reagent pads are visually compared to the color chart and results obtained for each of the test parameters. Specific Gravity: Tests for sample dilution. Normal levels for specific gravity will range from 1.003-1.030. Specific gravity levels of less than 1.003 or higher than 1.030 is an indication of adulteration. Nitrate: Tests for the presence of exogenous nitrate. 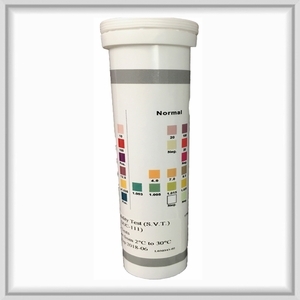 Nitrate level above 7.5 mg/dl in human urine is considered abnormal. Common occurrences are the additive of such products as Klear. Glutaraledhyde: Tests for the presence of exogenous aldehyde. Glutaraldehyde is not a natural component of human urine and it should not be present in normal urine. Common occurrences are the additives of such products such as Clear Choice or UrinAid. Oxidants and PCC: Creatinine: Tests for the presence of of oxidizing reagents such as bleach, hydrogen peroxide and pyridinium chlorochromate in urine.